Black paint makes a statement. It fits in any décor and can be dressed up or down. 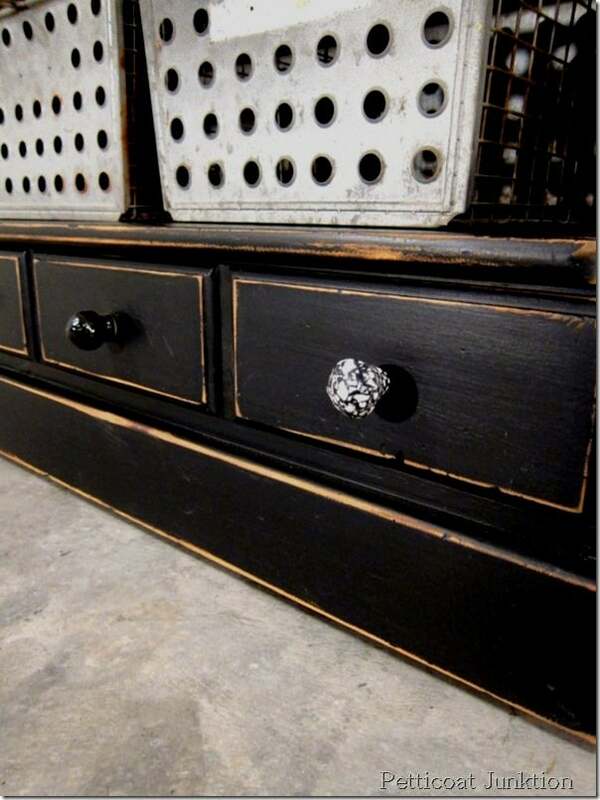 If I look at a piece of furntiure in the workshop and don’t know what to do with it….I go with black. Black furniture is so classy looking. 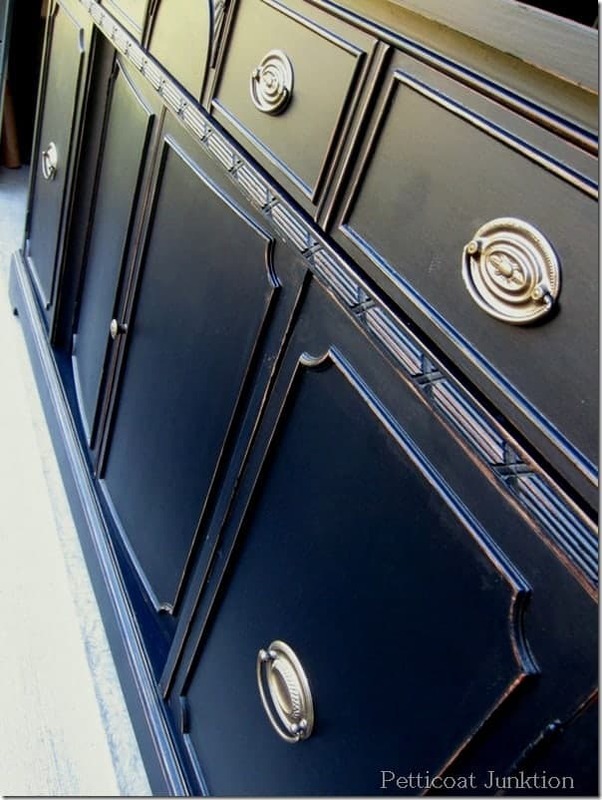 I’m featuring 8 of my favorite black furniture projects today. The top photo is my Hepplewhite Makeover. It is a super nice buffet in really great shape. This piece came from the Nashville Flea Market and what a change in looks. I love fuchsia and black together. It is a fun color combo. And adding scrapbook paper to the drawers takes this piece up a notch. I almost always distress my furniture makeovers. To me it adds character. You can click any of those pink links to see the full makeovers with photos and details. Sometimes custom paint jobs are the hardest but not for this client. I repurposed this piece by adding the wire baskets. Too cute! Do you like black furniture? The two nightstands were yard sale finds. See you tomorrow! 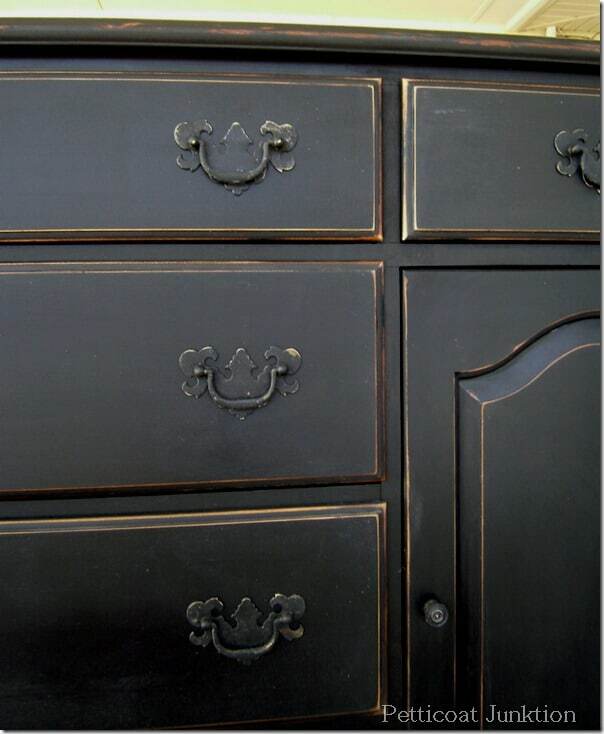 I am wanting to paint my bedroom furniture black. Can you provide steps of how you paint black? I have seen several different tutorials, all of which require sanding. Do you sand your pieces and prime before painting? I have a dresser that I as painting black and would like to add silver accent. Kind of Art Deco style. Any suggestions for the silver products? Do you also use an antiquing glaze on black pieces like the hepplewhite one? I’m about to redo a 70’s dining room set and I like the look you have achieved. I don’t normally use an antiquing glaze on black paint. Thanks for the question. 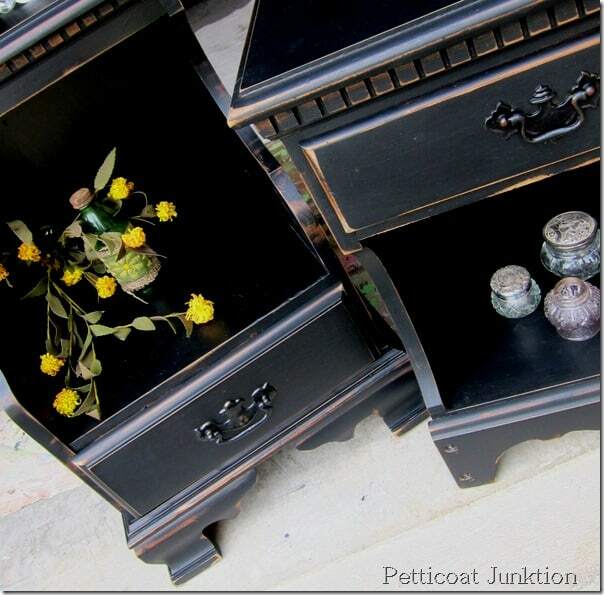 When painting furniture black. What type of paint do you use and do you use spray cans for the large pieces or a spray machine. Would so appreciate a tutorial for us gals who live across the country. I don’t use canned spray paint for furniture as a rule. Have been known to do it a few times. I usually just brush it on and my favorite black paint is Reclaim in Licorice…which is black. 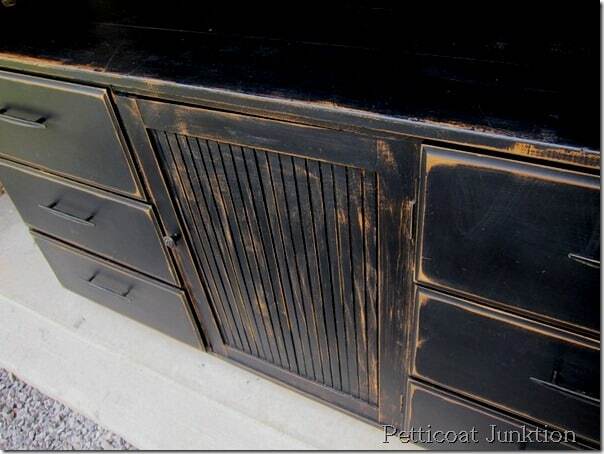 I just came over to see what you’ve done with black/distressed paint. I bought a diningroom hutch and started to paint it white. I want to display my red transferware on it. BUT now I’m seriously thinking of using black. What do you and your readers think? Will red and white china look good on the black hutch?? I was thinking the white might drown it out. Decisions!! I think red and white china would pop against the black background!! Once again, you have blown me away with your creativity. I LOVE the aqua and white dresser!!! And the black night stands and its all so easy for me (a newbie) to understand. Would like to know how to distress the furniture. Love the black. We just bought a house with white cabinets…I said NO NO NO…not again! So I have been painting them black. Very classic! Everyone loves them…so far. I also bought a beautiful old dresser/sideboard that I am going to refinish the top and fronts of the drawers, and then paint the rest black. This will be our coffee station! I hope it all comes out as well as I envision. Thanks for the inspiration! 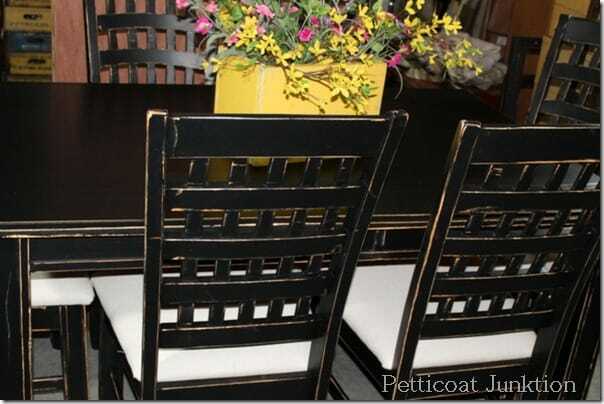 LOVE black furniture,I have several pieces I have redone.My kitchen chairs were bought at a sale for [email protected] & they were all different colors painted them black and distressed them. My husband laughs & says is everything going to be black. So I have been trying some chalk paint in different colors. Love it too. Oh, thanks for the nice story, and if you add some drop cloth seats send me a pic! thanks Angie, the pictures don’t do the Hepplewhite piece justice. I’m enjoying the weekend hope you are too! Those are beautiful! 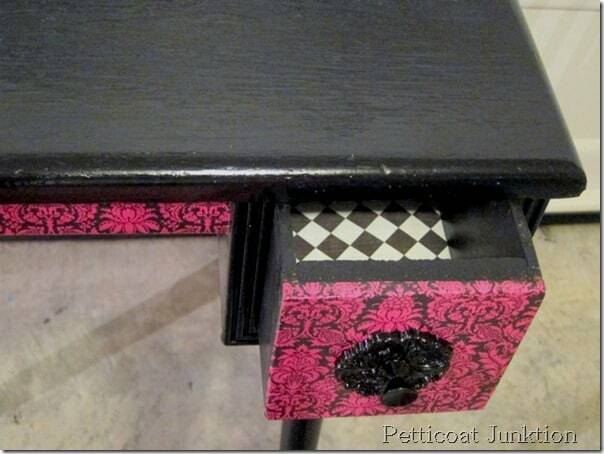 I do not have any black furniture…my twin sis does and it is classy! 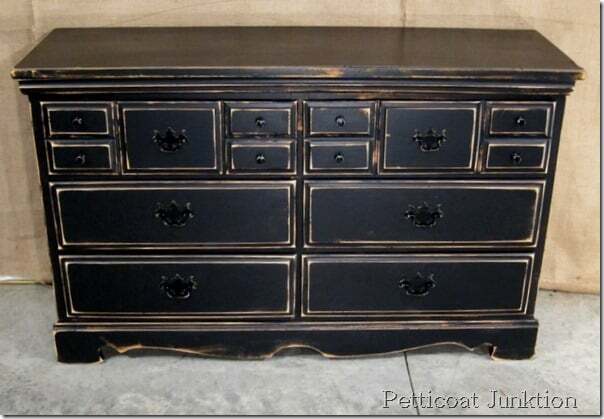 I tend more toward wood or white but I love the look of black furniture too. 🙂 Must be why I have eclectic mix of stuff, I never can settle on one look. lol.